We discovered that on warm Friday evenings when Brixton Village is stuffed that there are always places to be found furthest away from the main entrance. These are a little warmer than the ones near the breezy entrance but you don’t have to wait for a table. When we came across Elephant it was almost empty with large and small tables available. It is too small to have many inside so they are all in the alleyway. Elephant serves “authentic Pakistani street food” and has a short list on its menu but even so it is hard to choose. There are lamb or vegetable samosas which you can have with chickpea curry, a vegetable pakora and thalis vegetarian, chicken or lamb) and similarly curries. 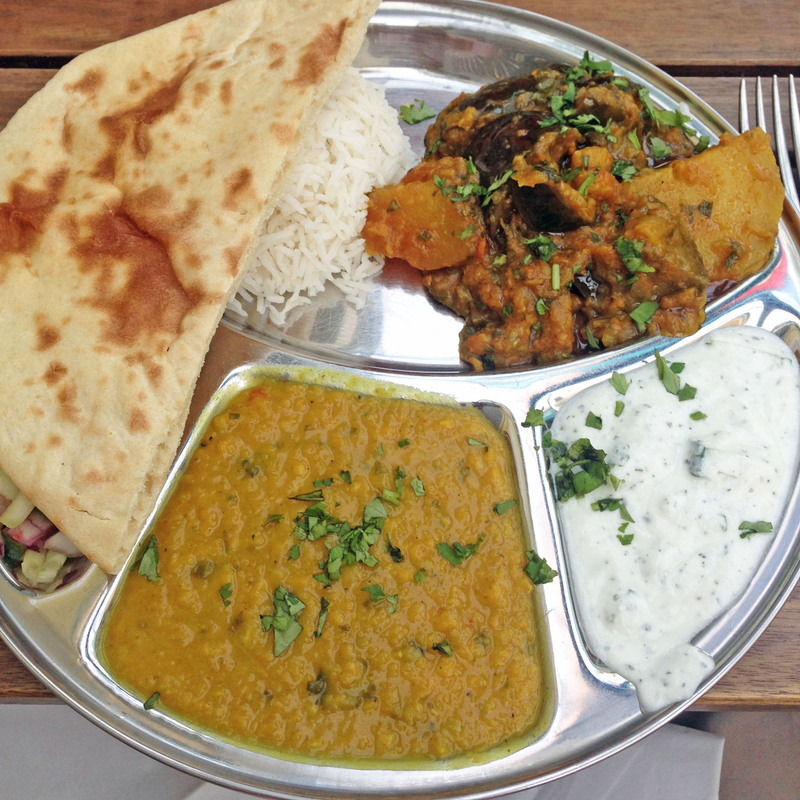 Our favourite has been the vegetable thali so that is what we chose again. It comes as a round dish divided into spaces with dhal, rice, vegetable curry, a tomato salad and a cucumber raita. The vegetable curry is soft aubergine, sturdy potato which is not sloppy in an onion sauce. The flavours are fantastic nothing fancy like a coriander seed hitting you between the eyes but all clear and yet subtle. All the grains in the rice fell away from each other but on top it was a little crispy. The dhal was hot with chilli and with a good sprinkling of garlic. This is comfort food but was also really full of flavour – despite the sweated brow mostly caused by the ambient temperature rather than the spice. They serve water and a variety of soft drinks including lassi and masala chai – they are BYO …but they ask for a £2.00 supplement per person if you do bring your own wine or beer. Now for an expensive bottle of wine that might …just might ..be OK but if you just bought a £1.00 bottle of beer then this is really extortionate and we did point that out. The bill came to £17.00 without any drinks – we just stuck to the water.